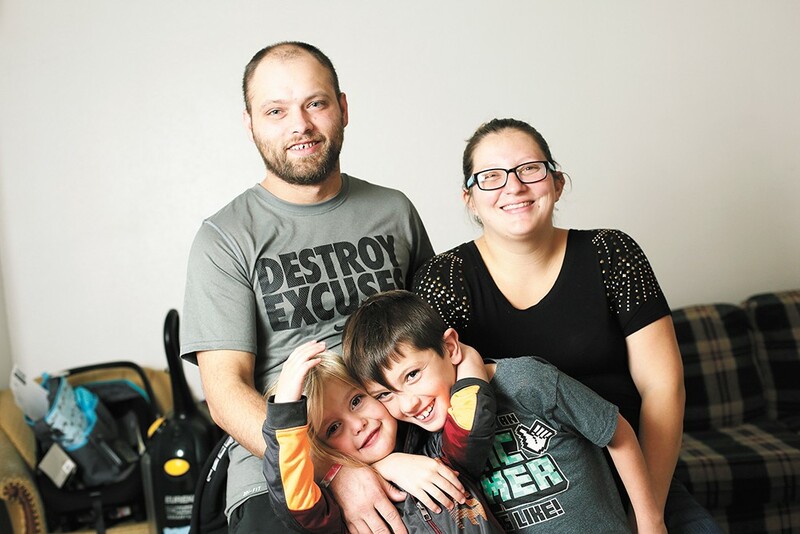 Thanks to a project by Priority Spokane, Brandon Taylor and Ashley Stannard found a home for their three kids the day before school started this fall. In February, Ashley Stannard walked into the school counselor's office at Logan Elementary with tears streaming down her face. She feared her three boys, all 8 or younger, would soon be homeless. "I said, 'I don't know what to do with my kids. I don't know where to go. I need help with my children. I need to make sure my kids have something — food, a house, something,'" she recalls. It's a situation becoming more common in Spokane County, where the number of students sleeping on couches or on the streets has reached 3,500. And behind each of those students is a parent or guardian, like Stannard, trying to figure it out. Luckily for Stannard, Logan Elementary had a way to help her family. The school referred them to Tami Cunningham, a community health worker placed at Logan under a project to house homeless youth by Priority Spokane, an alliance of community organizations currently focusing on that goal. 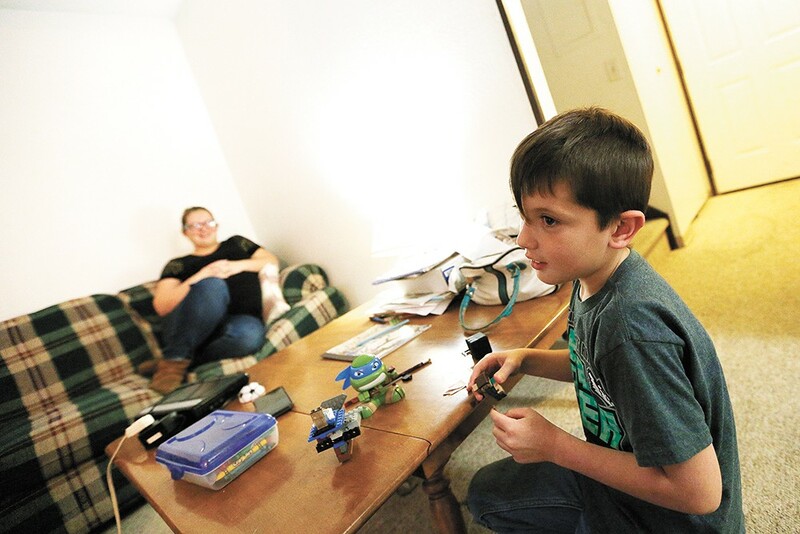 With Cunningham's help, Stannard, her longtime boyfriend Brandon Taylor and their three boys found suitable places to sleep until, months later, they found permanent, stable housing in an apartment complex on the South Hill. "The only reason we actually landed this place was because of Tami," Taylor says. After the first year of the three-year pilot project, Priority Spokane has found stable homes for 74 out of 100 homeless students split between Logan Elementary and two elementary schools in Deer Park. The results so far prove that having just one social worker dedicated to working with homeless students and their families in school can make a huge difference. It's a model that's relatively new both locally and nationally, says Ryan Oelrich, Priority Spokane executive director. And if it keeps working, its impact could spread far and wide. "What's most important is we meet the needs here and address issues here," Oelrich says. "But we have more than just local eyes on this." The idea Priority Spokane is testing for housing homeless youth is actually fairly simple: Place a community health worker, like Cunningham, inside the school, where students or families can seek her help whenever they need. Priority Spokane got the idea from the Siemer Institute, a national organization focused on stabilizing homeless families that also connected students with community health workers, Oelrich says. But those workers didn't actually have an office inside the school, so Priority Spokane took it one step further. "We said, why not just work in the school in the first place?" Oelrich says. Homeless students at Logan are referred to Cunningham by counselors, teachers or district staff, or from a student or parent walking into her office. Previously, school counselors could try to help struggling families, but they didn't have the time nor the same access to resources as someone like Cunningham, an employee of Catholic Charities. Cunningham helps students at the school, which really means helping the family. For example, she was able to find housing for Ashley Stannard and Brandon Taylor because their third-grader, Jordan, attended Logan. Cunningham does anything she can for the family. When Stannard, 29, and Taylor, 31, couldn't find work, Cunningham would tell them about available jobs. When they were sent to live out on the street this June, Cunningham told them about a family shelter, Open Doors, where the family lived for three months this summer. When they were denied an apartment, Cunningham would write a letter of appeal, or use her connections with landlords looking to offer families a second chance. When something fell through, Cunningham would text them, "keep your head up." Given Spokane's low vacancy rate, by late summer, a home still eluded the couple. By then they had learned they had a fourth child on the way. It was important for them to find a home before school, so that their kids could have a place to do their homework, to have friends over, to be a kid. Time was running out. Then they got a call from Cunningham saying a place was available. Still, Stannard and Taylor didn't get too excited — they had already applied for hundreds of other places. "I never wanted to get my hopes up," Stannard says. "I waited until I had those keys in my hand." This time they got it. It was the day before the start of school. They didn't even have beds yet. "I wanted them to have a home, some place to call home, before they started school," Stannard says. Now, Jordan has a living room where he can play with LEGOs on the coffee table. He has a dining room, where he can eat with his family. "That we get our own stuff," Jordan says. Jordan, a third-grader, says he likes having a home where he can play with LEGOs. Logan Elementary principal Brent Perdue had never heard about any program like this pilot project from Priority Spokane. But when he did, he jumped on it. Logan seemed like a logical choice for the pilot. It has the highest percentage of kids on free and reduced lunch in Spokane. And its mobility rate — the percentage of students transferring in and out of the school, often due to family instability — sits at around 40 percent. When students don't have a stable living situation, their learning suffers. They often miss school, or come to school tired or irritated. And when they're moving around to different schools, teachers can't get a sense of how to reach out and get through to them. Perdue can't say enough about what the simple presence of Cunningham has done. "I don't know what we'd do if we didn't have it. It's been a great resource," he says. If the results continue to be positive after the three-year pilot program, Oelrich says it will look to expand to other high-need schools. Each community health worker in a school costs $78,000 for salary and benefits, on top of a $10,000 "flex fund" to help find resources for families. It's possible that school districts can find the money to fund these positions in the future, Oelrich says. To prevent homeless students from switching schools, districts the size of Spokane Public Schools spend hundreds of thousands of dollars each year transporting students by taxi. If a community health worker can prevent those students from losing their homes in the first place, the program would pay for itself. Next year, Oelrich says, Priority Spokane hopes to move the project to Stevens County. But its reach could extend further. He says Priority Spokane is sharing its data with local, state and even national organizations that are interested in seeing how the project works. Perdue sees helping students and families in this way as an essential function of a school. It's the best way to put students on a path to success.